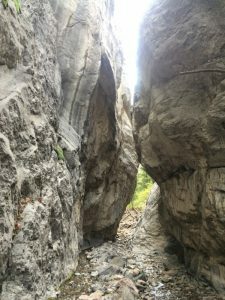 This week, we send you to a tall, tight canyon at the entryway to the Gates of the Mountains Wilderness – the perfect hike for staying cool during the hot, summer days. Beautiful canyons, vast views, gorgeous forests, and lots of history – the hike into Refrigerator Canyon on the northern edge of the Big Belts has a little something for everyone! Directions: From Missoula, take Interstate 90 east until the turnoff to Helena at Garrison Junction. From Helena, take Interstate 15 north to Custer Road. Exit to the right there, and after a mile turn left onto York Road. After about 16 miles, just before the York Bar, take a left onto Nelson Road. Drive another 10 miles, and as you pass through the town of Nelson keep to the right on Nelson/Beaver Creek Road. Another 2.5 miles and you’ll discover the trailhead on your left. Look for the sign for Refrigerator Canyon. What to expect: First, the quarter-mile ascent into Refrigerator Canyon. Then you’ll reach a series of switchbacks through the forest, which will take you about three miles up a moderate grade to a trail junction and the entryway to the Gates of the Mountain Wilderness. Turn left at the junction to continue on Trail #259. Going straight will take you to Willow Creek. From here there is a bit more uphill, but you will soon see the fruits of your labors – an open meadow to cross, with wide views of forested hills. Continue on the trail, which has now turned into an undulating game of uphill-downhill. Be careful of a narrowing trail with steep drop-offs. As you re-enter the forest, you will pass through an old burn area. At approximately seven miles into the hike, things begin to get a little rough. There are a multitude of trees down and the trail here hasn’t seen much love in the past few years. The last half mile to Bear Prairie is inaccessible, as there are too many trees down to keep to the trail. However, the views even from this point have made the hike worth the effort. If you care to brave the many, many downed trees, you can continue on the last half mile to Bear Prairie and even beyond, to the end of Refrigerator Canyon Trail at the Junction with Big Log Gulch Trail #252. Tip: Take layers for the canyon. It’s short but can get mighty cold!